It's funny but I can't remember the last time I was homesick. I'm thinking it has been well over a year. Which is weird. Because if you flashback to this time two years ago, I was dying for the beach. Pining away for my friends and family and the SUN. But mostly missing my mom's mochiko chicken. Kidding, but not really? I mean I was missing everything about Hawaii and finding it difficult to understand how it could possibly be 60°F in JULY. I'm still coming to terms with that last part. Come on Karl, (please go to @karlthefog on Instagram if this doesn't make sense to you), cut us a break--we like the summer too!! But my mom's chicken. Oh man, local (Hawaii) food in general. They say the way to a man's heart is through his stomach, well that's the way to mine too!! And while today I may not be homesick, I am 100% foodsick for some mochiko chicken fried up by my mama. Mochiko chicken is DA BOMB and if (just like butter mochi) you haven't heard of it till today, you're gonna wanna thank me. I'll take a "ho, brah, dis chicken is mean," or a "sista gurl, tanks fo hookin me up wit da kine." And if that just made zero sense to you, please turn to good old wikipedia and search "pidgin." If you don't get it after that, I'm sorry, I'm not that funny, so please disregard. 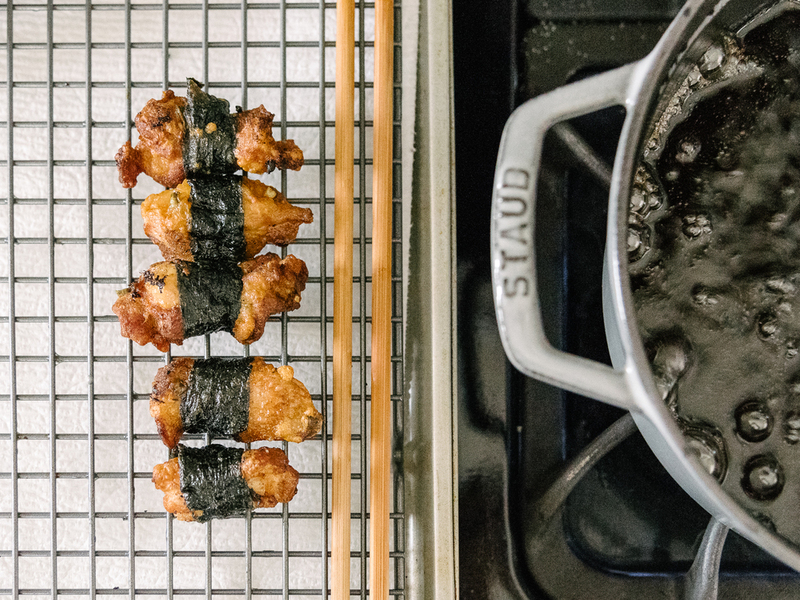 Mochiko chicken is no ka oi (the best) and it's perfect for potlucks. Hot or cold, it's good. Damn good in fact. And making it bite sized and wrapping it in nori (dried seaweed) makes it even better for a potluck. Because who wants to try to chat it up while knife and forking a big ole fried chicken thigh? Not me. But popping one of these delicious bites into your mouth? Easy. 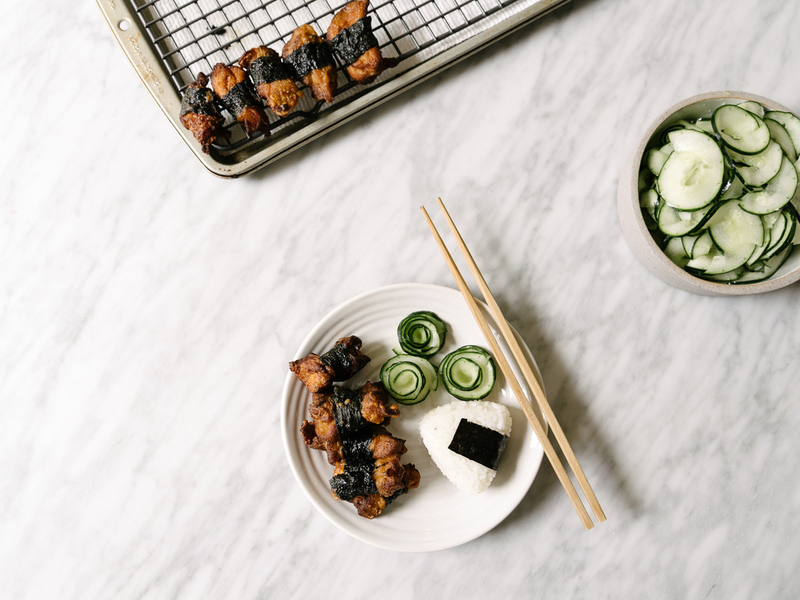 Pair these little bites of straight goodness with a mini musubi (which is how I prefer to enjoy them) and you're on the right track to having a good time. Throw in some quick pickles and now it's a party. If mochiko chicken is da bomb, adding quick pickles to the equation makes it da-bomb-dot-com. Seriously, David Chang is my hero for turning me on to quick pickles. HERO status. #Soletspigout, have a potluck share some recipes and do it all over a few drinks!! Cause it's Friday and all the cool kids are doing it. Please head over to Em, (the awesome author of The Pig and Quill) and Gina's (the equally awesome blogger bringing you So Let's Hangout) to find all the best recipes for your next potluck. Because summers are awesome for outdoor gatherings (unless you live in SF and then you may want to keep it indoors, especially if you live in the Sunset...irony) and who doesn't love a potluck. You can check out Stephanie's recipe for banh mi fries (YUM) or find out how to make Peach Melba Coconut Cream Sodas via Aida (holy double YUM) as well as check out all the other #soletspigout recipes here and here. So when are we having a potluck because you know what I'm bringing? P.s. I always bring dessert, so I'll be bringing these bad boys too!! Whisk together mochiko, cornstarch, sugar, soy sauce, salt, eggs, green onions and garlic in a medium mixing bowl. Add chicken to mixture and mix with silicone spatula to coat evenly. Marinate in fridge for at least 5 hrs but preferably overnight. Remove from fridge and wrap each piece of chicken with a strip of nori, setting wrapped pieces on baking sheet. Heat 1 1/2" - 2" canola oil in pan or pot on medium to medium-high heat. Place wire cooling rack over the second baking sheet lined with paper towels. Without crowding pan, fry chicken. Turn with skimmer or chopsticks, to brown evenly until chicken is thoroughly cooked. Chicken should be golden brown when done (about 6-7 minutes). Drain on rack and continue frying until all the chicken is cooked. Serve hot or cold and enjoy! Best enjoyed with mini musubis and quick pickles. **You do not have to make bite sized pieces. You can skip step one if you'd like full-sized pieces and can also forgo wrapping in nori if you prefer. Please note that frying time will increase to around 9-10 minutes for the larger pieces. Using mandoline, cut the cucumbers into 1/8" thick slices. Place in a medium mixing bowl and add sugar and salt. Stir with silicone spatula to combine. Cover bowl with plastic wrap and refrigerate for at least 10 minutes.